I knew this article was coming out, but didn't think to look it up until today. I'm glad I did. It starts off with kids trying out the oil test, and leads to my favorite line in the article, when the kids are asked if there's oil in candy: “No. Who puts oil in candy?” Emily said. 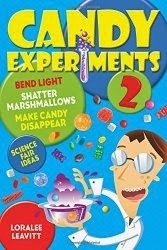 “That’s gross.” You can read the entire article "Cooking with Kids: Candy Science" at Columbus Parents online.